First I'd like to thank you all for stopping by, commenting and for being so utterly amazing while I was sick and unable to visit back or reply. I appreciate you all SO much. You're the best. For those of you who don't know, the Bane Chronicles are a series of short stories centered around Magnus Bane, a secondary character from Cassandra Clare's Mortal Instrument series and her Infernal Devices series. The stories were written by Clare herself and Sarah Rees Brennan. I hope you'll forgive me for reviewing them out of order. Being very familiar with all the characters and the situations Magnus finds himself in in these stories made it possible for me to enjoy them in order that suited me. Each of these stories functions as a standalone. In Edwardian London, Magnus Bane discovers old friends and new enemies…including the son of his former comrade Will Herondale. One of ten adventures in The Bane Chronicles.Magnus thought he would never return to London, but he is lured by a handsome offer from Tatiana Blackthorn, whose plans—involving her beautiful young ward—are far more sinister than Magnus even suspects. In London at the turn of the century, Magnus finds old friends, and meets a very surprising young man...the sixteen-year-old James Herondale. 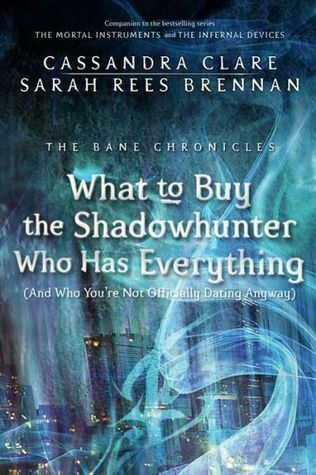 It was clear right from the start, in City of Bones, that Magnus Bane will never be content to remain in the background. He is too fabulous a character to ever be called side, secondary, or anything else to that effect. The Bane Chronicles finally put this powerful, yet kind-hearted immortal front and center, right where he deserves to be. The Midnight Heir takes place in Edwardian London, and it gives us an opportunity to reunite with Will, Tessa, and even Jem. It is a great introduction into the upcoming trilogy centered around Will and Tessa’s children and their peers. It was clear, even from this very short story, that we can expect a lot of pain and heartbreak from the lovely 17-year-old James Herondale. He is Will’s son after all, and judging by this glimpse into his life, he is just as tortured as his father used to be, albeit in a very different way. Each of the Bane Chronicles stories is narrated by a different person, which I don’t really understand, but luckily, they’ve all been great so far. David Oyelowo gave a wonderful voice to Magnus Bane, laced with wisdom, humor and kindness. The audio version doesn’t really cost much more than the ebook, but it will give you 90 minutes with Magnus and the others, and reading the ebook would take no more than 10. If you don’t already have your copy, I highly recommend getting the audiobook. My interest in the Mortal Instruments vanished completely right around the time the original trilogy ended. I resented Clare for milking the cash cow, so to speak, and dragging out something that ended quite nicely in book 3. However, my investment in some of the relationships, especially that of Magnus and Alec, never quite disappeared. In this novella, we find them at their very beginning, shy and tentative, careful not to overstep the boundaries. It’s Alec’s birthday and Magnus wants to give him something thoughtful and memorable, something that says just how much he’s grown to care for the shadowhunter. Being who he is, he goes about it in his usual, outrageous manner. Seeing Magnus “officially besotted and revolted by himself” was hilarious and absolutely delightful! This is a fairly brief novella, but fans of the couple will certainly enjoy seeing Magnus so completely infatuated with Alec. Although we don’t see much of Alec himself, he is present in Magnus’ every thought. Jordan Gavaris is my favorite narrator of these novellas. His voice is very light and humorous, with a barely discernible seriousness underneath, which fits Magnus extremely well. For this too, I highly recommend getting the audio version. Copies of these novellas were kindly provided by the publisher for review purposes. No considerations, monetary or otherwise, have influenced the opinions expressed in this review. I haven't picked up the second set of books either for the very reason you mentioned, I liked how it ended and was a little upset that she decided to cash in and make more books in the series when it wasn't necessary. I still haven't read them and honestly I don't think I will. I read the first book in these and didn't' care for it even though I love Magnus, maybe I should give another one a try? I've read a couple of these books but have never gotten into them all that much. I do think it's interesting that Clare teamed up with other YA authors to write these novellas. Still not sure I'll read them but thanks for the reviews! That reminds me that I need to go write an audio review! How out of the loop am I Maja that I had no idea there was another trilogy coming up? Like you, I lost interest in this series when the original trilogy ended and I couldn't finish the Infernal Devices because I was so irritated by what people told me happened in the epilogue of the last book, so I don't know if I'll read this new series. I will however, be reading these novellas, I adore Magnus! I particularly want to see him besotted, so the second novella you posted is going on my Kindle asap! Oh I didn't know these ones, is it only in audiobook? well because I haven't tried any yet so it's always a little easier for me. But it sounds really nice, I haven't anything by these authors yet. I hope you are back on your feet, we have missed you. This series is totally new to me and I must admit you have me quite curious. Get well soon! I didn't know you were sick... hope you are better. I have been really curious about this novella series as I adore Magnus, but I have been waiting for them to be released in one volume as I find it a hassle right now. Different narrators, that is odd. How have I missed these? They sound like awesome compliments to the world. I need to look into these. Thank you! Great reviews! I lost interest after the first three Shadow Hunter books. I tried the first Infernal book but it didn't hold me. These sound great though! I really loved Mangus, so I think I'll have to find these and give them a try. Oh I'm curious about audiobook minis to start. I still need to read this series. I have the first 2 books on my tbr. Darn time! Will have to add these to my list! Sweet! Oh and I hope you are feeling better. Know how that goes. Couldn't come yesterday to comment so I understand! i heard these were pretty cool but since I never read city of bones I didn't know if I could just read this. Hopefully I can make time for the other book and get to know his character through them first. 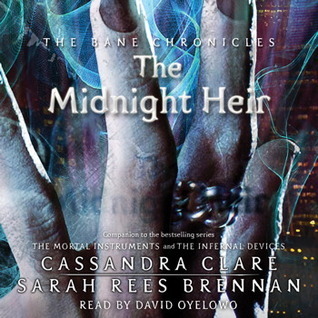 I've always enjoyed the Mortal Instruments books, and also Magnus's character, but I've never really been too interested in checking out any of these Bane Chronicles stories. But now you've made me curious! Especially with the mention of tortured James Herondale. I'd like to find out more about him. I'm glad you enjoyed both of these Maja, and I hope you're feeling better now!